Three of the top six auto insurers in the country often ignore an important actuarial variable and fail to give low-mileage drivers a break on rates, the Consumer Federation of America announced Thursday. The federation sought quotes for a hypothetical 30-year-old unmarried female bank teller with a high school degree, a spotless driving record and a 2005 Honda Civic in the driveway of her rental home (located in a ZIP code with a $30,000 median income). The only variable was whether she drove 5,000 or 20,000 miles per year. Only No. 1 State Farm consistently gave discounts to Ms. CFA for driving 5,000 miles. No. 6 Farmers and No. 4 Progressive didn’t even ask about mileage “in most cases,” according to the federation, and the duo and and No. 3 Allstate “often or always” gave her the same price at either total distance. No. 2 GEICO gave discounts in most cases, though often not as much as State Farm. USAA, which the National Association of Insurance Commissioner announced in March beat out Farmers to become No. 5 in 2014, wasn’t surveyed. The federation, which refers to “the five largest insurers” in its news release, apparently used 2013 market shares to determine the scope of its study. California requires insurers to use miles driven to calculate rates — and it’s interesting to note the difference in rates the federation found. If Ms. CFA lived in Oakland, she’d only have to pay between 72 and 83 percent of the higher-travel cost if she only drove 5,000 miles. “If insurers were to properly reward consumers for less driving, that would not only lessen their auto insurance costs, but also reduce the number of uninsured motorists, accidents, air pollution, and the impact on global warming,” former Texas Insurance Commissioner J. Robert Hunter, federation director of insurance, said in a statement. Interestingly, the consumer group’s findings regarding Allstate and Progressive rates even seems to contradict what the No. 3 and No. 4 insurers have said about mileage. The group quotes Allstate President Matthew Winter as saying May 6 “this trend [of increased claims and losses] is externally driven, primarily by miles driven.” Progressive itself has found miles driven important, measuring it on Snapshot. 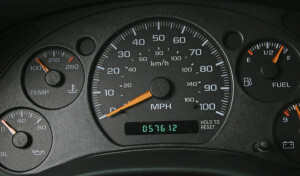 However, Progressive spokesman Jeff Siebel wrote in an email to NBC News contributor Herb Weisbaum of ConsumerMan that “mileage in and of itself is not highly correlated with risk of loss,” and 13 billion miles of Snapshot data show “how you drive is more important than how much you drive.” Snapshot also measures speed changes (indicating hard braking, for example) and time driven. State Farm, GEICO and Allstate didn’t respond to Weisbaum/NBC’s request for comment. Farmers directed the network to the Insurance Information Institute. The Consumer Federation does acknowledge that where you’re driving in all that mileage is more important than gross mileage — fewer accidents occur on highways. But gross mileage still matters, it says, citing Quality Planning, Wharton business school and Massachusetts Institute of Technology research. Also, other data indicate that lower-income drivers log fewer miles. “The high annual premiums for low mileage revealed by our research suggest that low- and moderate-income drivers are greatly harmed by the refusal of many insurers to reward this low mileage,” Brobeck said in a statement. The federation also criticizes the idea that an insurer can’t get accurate mileage without a telematics device (which many eventually will likely adopt anyway), pointing to past odometer reads done by insurers, state smog checking programs and entities like CARFAX. “The complaint of some insurers that they cannot easily determine accurate odometer readings is just an excuse,” Hunter said in a statement. “Getting this information is relatively easy, as some insurers have demonstrated. And how many insurers are carefully checking on factors like education and occupation that they are increasingly using in their rate-making?” he added. About 61 percent of consumers surveyed in 2012 felt using annual mileage to determine rates was a fair method, according to the federation, so insurers might want to reconsider such discounts if there is actuarial merit to them. A more precise method might be to track mileage by ZIP code or other approximate location — insurers knowing exactly where your car was at all times raises privacy concerns — through telematics for a determination of miles in urban versus highway settings.